18 August 2005: In economically deprived Kyrgyzstan, young people are increasingly migrating from rural areas to urban centres such as the capital, Bishkek, in search of improved employment prospects and education. For thousands of young people from rural Kyrgyzstan, moving to cities is one of the few options they have. "Next year I will finish secondary school and will go to Bishkek. My elder brother is already there. I do not know whether I will be able to study at university. If not, I will work and help my family," 16-year-old Zaripa explained, speaking from her home in Juzumjan village in the southern Jalal-Abad province. Such plans are not unusual in this mountainous former Soviet republic, where upwards of 40 per cent of the country's 5.1 million inhabitants live below the national poverty line, according to the World Bank. National statistics show that young people, between the ages of 15 and 29, account for nearly 30 per cent of the population. While there are no definitive figures on the number of people opting to move to the cities, their departure from thousands of rural villages and hamlets scattered across the country has already left its mark. "This year in our village, 70 young people have already left. Each year this number is increasing," said Kerimjan, a 38-year-old farmer from Jany-Jol village in the Aksy district in southern Kyrgyzstan. Mehrigul Ablezova, co-chair of the Sociology department at the American University in Bishkek, has carried out research into social change in Kyrgyzstan and published a report entitled: "A Generation at Risk? Childhood poverty in Kyrgyzstan." "Though in our research we do not study youth particularly, I can say that the main reason behind the migration of youth to cities such as Jalal-Abad, Osh and of course Bishkek, from the south of country, is to get a job, while in the north, young people go to Bishkek to get an education," said Ablezova. The figures she has arrived at illustrate the point clearly. Her research has concluded that 28 per cent of young people in the south leave to study, while the overwhelming majority, 58.1 per cent, leave to find work. Conversely, 42.2 percent of people in the north migrate to study, while only 33.7 per cent leave in search of improved employment opportunities. Poverty, which is particularly acute in the south of the country, is the primary factor fuelling this migration. According to the United Nations Development Programme (UNDP) poverty reduction programme, most poor people live in rural areas of the mountainous landlocked state. "The majority of our children go to Bishkek to get a job because there are no economic prospects for them here. There is neither land, nor work. Next year, 200 children are finishing secondary school and I am sure 70 of them will leave. In our village, in each family there are one or two children who have gone to the cities to work," said Dauletbek Bekkuliev, a village resident in the Aksy district of Jalal-Abad province. But prospects in the city are not always as bright as the hopeful young migrants may imagine. Many new arrivals are forced to work as common day labourers or in local bazaars. Those that are lucky, however, may be able to enter university and work part-time, providing a much needed source of income for their families back home. "I study at the National Pedagogical University on a part-time correspondence basis and also work at the Osh bazaar. In the future I want to stay in Bishkek. What will I do in my village? There are no jobs, nor future for me and my children," said Kylychbek, a 22-year-old man from the town of Naryn in northern Kyrgyzstan, speaking to IRIN in Bishkek. 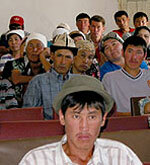 Others such as nineteen-year-old Alaybek, are a lot less fortunate. He now works as a cart-pusher at the Dordoi bazaar in the capital. "I came here two years ago and could not go to university. Now I work to help my family in Batken, southern Kyrgyzstan. I have three younger brothers and two younger sisters," said Alaybek. In addition to the dearth of employment opportunities in rural areas there is also a chronic lack of facilities for young people living in the countryside. "In my village there is nothing to do. That's why I came here. Here, life is better and more interesting," Samat, another young man at the Osh bazaar said, reflecting on life in the capital. Many youths who have chosen to migrate will stay with relatives who already live in the cities. "After completing my military service, I was at home because there were no jobs in my village. Then my parents decided to send me to Bishkek. My older sister was already there selling cigarettes, chewing gum and other stuff on the street," said Kuban, who came from the town of Kochkor in northern Kyrgyzstan. Improved earning power in the cities does have some positive impact on the countryside though. Some villagers appreciate the significance that cash remittances from their children are having on their lives by improving their financial position. "Now my two sons and daughter live in Bishkek. Two of them study part-time at the Kyrgyz National University, while also earning money and helping us," Jailobek baike, a 54-year old villager told IRIN, in Jalal-Abad province. Kyrgyzstan formally the Soviet Kyrgyz Republic borders China, Kazakhstan, Tajikistan, and Uzbekistan. Its capital is Bishkek. Most of cities in Kyrgyzstan were established during the period when Kyrgyzstan was part of Russia or during Soviet period but some towns are centuries old. 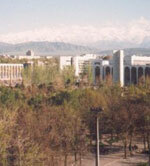 Bishkek was built on the ruins of a number of ancient cities during Russian and Soviet eras. Once a republic of the Soviet Union, Kyrgyzstan has been independent since 1991. Remaining reasonably stable throughout most of the 1990s, the country's young democracy showed relative promise under the leadership of former President Askar Akayev, but moved towards autocracy and authoritarianism. In April 2005, President Askar Akayev resigned following an unexpected and short popular uprising. Kyrgyzstan held a presidential election in July 2005. It saw a landslide victory for acting President Kurmanbek Bakiev, marking the end of his interim government.